A Glasgow City Council report published last week – Traceability in the Halal Meat Supply Chain – alleges that halal meat from illegal sources has been supplied to Glasgow establishments since 2010. 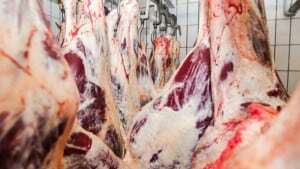 In one instance, nearly one tonne of meat from two Glasgow halal butchers was seized. It was discovered that the meat was being supplied by an unapproved cutting plant in Lancashire. Recent allegations include: meat being supplied by unregistered traders, supplied meat lacking any health marks and illegal street-trading of meat from unmarked vans. The report attributed the 2013 horsemeat scandal as raising public awareness surrounding food fraud and the importance of traceability in the meat supply chain. In addition, there are also fears that illegally slaughtered animals are being entered into the food chain. With 43 halal butchers and several cutting plants located in Glasgow, the city plays a central role in the industry. However, it is highlighted that “with this key role comes a risk to reputation if the supply chain is subjected to criminal activity”. To overcome challenges facing the industry, Glasgow City Council hopes to ensure that all halal meat supplied to Glasgow food businesses can be verified as coming from legitimate sources, and to protect the sector from food crime. To get this project off the ground, traceability inspections were carried out in a small number of halal establishments. To help businesses, guides and ‘traceability packs’ were distributed. A database was created using supplier information to identify known registered suppliers. So far, three unregistered halal meat suppliers have been identified in Glasgow. According to the report, these suppliers were traced and are now registered as food businesses. The correct procedures have been taken to ensure that they are subject to food hygiene and food standards inspections.